Baggies bringing baggage to SJP? Newcastle United vs West Brom match preview | NUFC Blog. 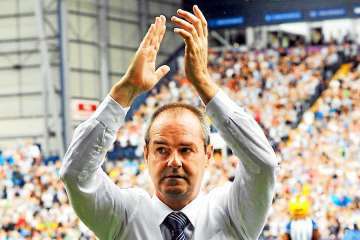 It is probably no exaggeration to suggest that Steve Clarke and his Baggies have supplanted Pardew and the Toon as this season’s surprise package. While Pardew has floundered his way around in trying to find a first choice XI that works, ex-Magpies caretaker boss Steve Clarke has unearthed a “Tiote” and managed to snap up a former loan keeper to help push his team up into the heady heights of “European Competition” places. – five places and four points above his former employers. The “Tiote” signing was Claudio Yacob, an Argentine international and a Bosman free transfer, who was playing for Racing Club de Avellaneda in the Argentine Torneo Apertura, and had been their club captain for four years. The difference between the two is that Yacob is viewed by fans as the most complete all-rounder Albion have had in the centre for many years and doesnt suffer from the “red mist” that appears to shroud wor Cheick on a regular basis. With Yacob and Ben Foster now a permanent signing, the Baggies record at home this season has been impressive. Victories against the Liverpool (3-0) followed by a 2-0 win against Everton, plus wins against QPR and Reading had them in fourth place early on in the season. However a 1-2 defeat at home to Citeh and relatively poor results away from home has seen them slip down the table. On the road, they have been beaten 0-3 by Fulham and held to 1-1 draws at both Spurs and Aston Villa. Added to which they have scored just two away league goals this season, the joint-lowest in the Premier League with West Ham, Aston Villa and Norwich. When we returned to the Premier League as First Division Champions it was West Brom who joined us in the automatic 2nd placed berth, having experienced something of a “Yo Yo” existence between the two divisions in recent times. This is now the Baggies seventh season in the BPL having entered the top tier for the first time in 2002 but swiftly returning from whence they came. In fact since then they have “bounced” between the two divisions with almost monotonous regularity achieving promotion back to the Premier League in 2003–2004, 2007–2008 and of course in 2009–2010 which may go some way to explaining the “Boing Boing” Baggies epithet? The overall head to head record between the clubs shows that the Baggies early history, when they won most of the club’s major honours, was a contributing factor in their win ratio. It is only in more recent times that Newcastle United have managed to redress the balance. However the more recent history of Premier League matches between the two sides shows that even with Pardwho in charge we’ve managed to come out on top overall. The Premier League stats are as follows. Which suggests that good old “flavour of the month” 4-4-2 formation will win the day once more! Cheick Tiote serves the first of a three match domestic ban following his red card indiscretion against the Makems last week, and will also miss our trip to Liverpool and the visit of Kevin Nolan and Andy Carroll with West Ham. Apart from that NUFC look to be in reasonable shape despite the small squad and Pardew is likely to restore most of the men he left out of the starting line-up for Thursday night’s 1-0 Europa League victory over Club Brugge. So Tim Krul, Danny Simpson, Fabricio Coloccini, Mike Williamson, Yohan Cabaye, Jonas Gutierrez, Hatem Ben Arfa, Shola Ameobi and Demba Ba should all play some part on Sunday. The only real issue will be who will fill Tiote’s boots? Newcastle United Squad: Tim Krul (G), Steve Harper (G), Danny Simpson (D), James Tavernier (D), Shane Ferguson (D, M), Steven Taylor (D), James Perch (D, M), Mike Williamson (D), Davide Santon (D), Yohan Cabaye (M), Jonas Gutierrez (M), Hatem Ben Arfa (M, F), Vurnon Anita (M, D), Gael Bigirimana (M), Sylvain Marveaux (M), Gabrie Obertan, Abeid, Amalfitano, Sammy Ameobi, Ba, Cisse, Shola Ameobi, Campbell. Injured: Haris Vuckic, Ryan Taylor, Dan Gosling (all knee), Rob Elliot (Groin / Pelvis). Steven Reid and Boaz Myhill are both missing, while Chris Brunt, Billy Jones, Jerome Thomas and Claudia Yacob were all doubtful early on in the week. However latest news suggests that club skipper Brunt and right-back Billy Jones have resumed training and could be in contention and Yacob is now back in contention. West Brom Squad: Ben Foster (G), Boaz Myhill (G), Luke Daniels (G), Billy Jones (D), Gareth McAuley (D), Jonas Olsson (D), Gabriel Tamas (D), Craig Dawson (D), Gonzalo Jara (D), Goran Popov (D), Liam Ridgewell (D), Youssouf Mulumbu (M), Claudio Yacob (M), Chris Brunt (M), Graham Dorrans (M), James Morrison (M), Yassine El Ghanassy (F), Zoltan Gera (M), Marc-Antoine Fortune (F), Peter Odemwingie (F), Romelu Lukaku (G), Shane Long (F), Markus Rosenberg (F). Injured: Steven Reid, Boaz Myhill. Doubtful: Chris Brunt, Billy Jones. As usual I will give two possible line ups for the Toon – Pardew’s and my preferred choice. NEWCASTLE UNITED (My own prediction, 4-2-3-1). I said last week “Toon need to get a positive result at the Stadium of Light for all sorts of reasons” . To a certain extent, Pardew got out of jail with a “backs to the wall” performance from his team, albeit with just the one point. For a team who have only won once in their last 7 Premier League outings, this is a must win game. We do need the three points on Sunday if we’re to sustain any sort of challenge for the top European places, and the opposition will help us determine how good we are in terms of the chasing pack. Pardew has to focus on that fact otherwise we could see our hopes for a top six place slowly disappearing before we even reach Christmas. West Brom are a good side even if they are looking for their first Premier League away win of the season. Clarke has his team playing positive football and in Long, Dorrans, Fortune and Brunt, they have pace in their side and enough to unsettle a static defence without sufficient midfield cover. One day, hopefully soon, Pardew will resolve the tactical/selection dilemma which he has failed to address properly this season. Tactical formations as well as player selections need to show some consistency as well as creativity. Hatem Ben Arfa needs the freedom to attack at will, and Cabaye has to continue his improvement on what has, so far, been a disappointing start to the season. If they’re both firing on all cylinders we could win this one! NUFCBlog Author: AndyMac	AndyMac has written 13 articles on this blog. I’ll be there. Obviously I’m hoping for a victory to us but I think a draw might be right – we get alot of those now. I just downloaded Microsoft W8 and it is totally confusing. Why is no one wanting to play Steve Taylor, would have thought he was an obvious choice. I’d have Anita in for Tiote, in fact I’d play him before Tiote even if he wasn’t suspended. I’d also start Shola before Cisse. Anyway we have to beat the WBA’s of the world at home every time if we hope to have aspirations to better things, 2-0 to us? Havn’t much knowledge about W8, but isn’t it touch screen orientated. No mouse needed, as an oldie I’d struggle with that. Just off for a 45th wedding anniversary lunch with my long suffering missus. I’d have Saylor back but Pardwho chose Willo over him last Sunday in a blaze of “who said he was third choice ?” headlines. As for Anita, he looked well off the pace on Thursday night but that could be because he wasnt playing as the main DM ? With Bigi and him alongside Tiote it was very crowded in central midfield so maybe a role alongside Perch would help ? When Tiote doesnt play I believe Perch is the next best option as he does get stuck in and can play a mean pass if called upon. The Baggies are a 4-2-3-1 side and have been all season which suits the players they have at their disposal (please note Pardwho). So I chose a similar formation because I think the back four are going to need defensive cover to combat Long, Brunt, Morison etc. I would prefer Bigi replacing Tiote not Anita, but Pards will most probably choose Anita. Hopefully Cisse gets a goal today if he starts. Here’s my pick for what it’s worth. With Jonas as a CD to cover Santons runs, plus having Fergie on the wing, will provide plenty of supprt for Cisse, plus the occasional shot from both. Playing Anita alongside him will give us both defensive help on the right side of midfield, that, plus his passing is good. Cabaye as the back of a triangle, with Cisse/Ba up front and HBA and Ferguson wide on both sides. We can bring in Bigi for either Jonas or Anita. Sammy for HBA or Fergie. Perch either in midfield or across the back four. Hell why am i not managing this side ? Andy, Our Silver Supremo’s name is NOT spelt P-A-R-D-W-H-O! Oh! sholdda said nice Preview AndyMac. Though i’ve noticed it has become de rigueur, to give the last ten years of results against our opponents. Meaningless stuff, really, unless you are into stats. So in future can we leave it out ? Just a suggestion, no offense ! Kindda like “the Grey Gadgie” myself, outta here gotta watch the Mersey derby, with Liverpool up by two, larer. Everton just scored, getting interesting! The match banter post for the game is up now. If you cant see what’s needed to change a game around you might as well be the kitman or the physio for all the good you’re doing in the dug out ! However if you dont think it’s relevant, ask WT to change it ! Man.u vs Chelsea about to start, with Toon vs.W/brom in an hour, delayed tape i guess. Mersey derby was a game of the famous two halfs, the first period exciting wth goals. The second scrappy and full of fouls, you couldda turned your sets of at half time. Yeah read an article where he was on about Clarke, a very patronizing statement, that obviously intended as a put down. A bit of faint praise for the new kid on the block, but i been around the block myself, type crap, about a guy who’s twice the manager he will ever be. A guy who learned from the best, Morinho and SBR, jerk! Oh ! Oh! goal no 2 from RVP. two zip ! Can’t get involved with NUFC match banter, as the game in it’s entirety is coming on in forty odd minutes.